The MC30 is ideal for securing Motorbikes, Quad bikes, Lawn mowers and other items of high value. 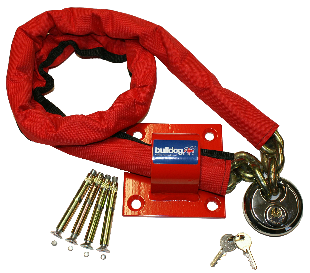 1.5m long grade 30 short link chain, includes chain, padlock, ground anchor and security fasteners. The chain is British made and case hardened for resistance against cutting and cropping. Covered in high visible sheathing. Stainless steel padlock, complete with 2 keys.